The Glen Ellen Inn's seven "Secret Cottages" in the heart of the original wine country, Sonoma Valley. 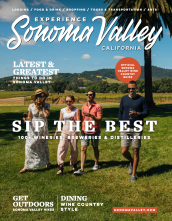 Our boutique Sonoma hotel is located in the little historic village of Glen Ellen, walking distance to many winery tasting rooms, and restaurants. We are only 10 minutes away from the downtown historical Sonoma Plaza. Hidden away behind the Glen Ellen Oyster Grill and Martini Bar, each Secret Cottage has its own fireplace, Jacuzzi tub, shower, TV, fruit & pastry basket, in-room coffee and honor bar. We do not charge any extra cleaning fees or resort fees, and parking is always free. We have indoor and outdoor fireside seating in this romantic wine country cottage. Enjoy sizzling steaks, fresh seafood, local produce, hand-cut pastas, house-made breads, ice creams, local Sonoma Valley Wines, martinis and a full bar.